Thanks to advancements in tooth restoration technology, dental porcelain can be sculpted to closely replicate the look and feel of natural tooth enamel, while providing the strength and resilience of natural tooth enamel. Porcelain veneers are ideal for individuals looking to make slight position alterations, or those who wish to change the shape, size, and/or color of their teeth. And while porcelain dental veneers are technically considered a cosmetic treatment, they can also make it easier and more comfortable to chew food. If you are considering veneers, this guide will tell you what you need to know. The bond is the most important aspect of a veneer. To apply a veneer, your dentist will remove a very small amount of the original tooth, usually less than a millimeter. This not only creates room for the veneer to fit within the mouth, but also ensures accurate tooth function and placement. Light-sensitive resin is placed between the original tooth and the veneer and hardened using a special curing light. The good news about porcelain veneers is that they are quite simple to maintain—you simply treat them as you would your original teeth, with routine brushing, flossing, and visits to your St. Louis dentist. Your dentist may recommend non-abrasive fluoride toothpaste to keep your porcelain veneers looking like new. And if you have a habit of grinding or clenching your teeth at night, your dentist may fit you with a nighttime bite guard to avoid damaging your veneers . There are alternatives to porcelain veneers, so it helps to know the pros and cons before you have them applied. 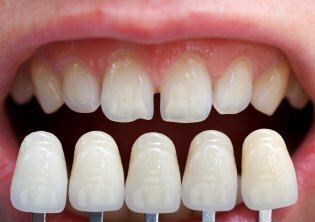 One major benefit of porcelain veneers is that they look and feel identical to natural teeth. Custom-made veneers also resist coffee and tea stains and cigarette smoke. On the downside, a veneer is not considered a reversible treatment, as a portion of the original tooth must be reduced prior to application. Porcelain veneers are also brittle and should not be used to chew on ice, bite fingernails, or open bottles with. 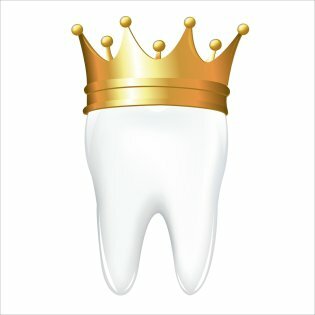 Getting crowns used to be an expensive and time-consuming endeavor. Fortunately, advancements in tooth restoration technology make it possible for your St. Louis dentist to design, build, and place custom restorative devices in a single visit using color-matching ceramic. There are numerous benefits of receiving same-day crowns . One advantage of this approach is that there is no need for temporary restoration and that there are fewer injections and less discomfort overall. Same-day crowns are completed in a single dental visit, which means you can spare the time and inconvenience of scheduling multiple appointments. Another advantage of same-day crowns is that more natural tooth is saved, which can improve long-term oral health. There are a lot of dentists to choose from in St. Louis, but some are better than others. 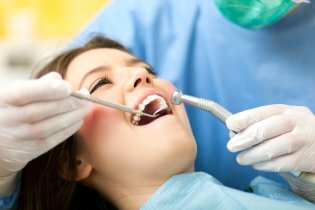 You should take every precaution to ensure that your dentist is experienced, professional, and able to perform the services you and your family need. Whether you need a cosmetic dentist for teeth whitening, an oral surgeon to perform a dental implant, or you simply need a checkup, these tips will help you find a dentist you can trust in St. Louis . You trust your friends, family, and neighbors when they make recommendations about which movies to see and which new restaurants to check out, so why not ask them for a dentist recommendation? Even if your friends and family don’t have any dentists to recommend in the St. Louis area, they will almost always tell you which dentists to avoid. There are a lot of “specialized” dental practices in St. Louis, especially of the cosmetic variety. You could drive all around town to different practices, or you could find a dentist that offers all the services you need. West County Dental, for example, provides everything from teeth whitening and Invisalign to oral surgery and dental implants. Once you build a relationship with your dentist, you will be happy that you don’t need to go anywhere else to undergo a special treatment. Most traditional insurance plans (sometimes called “indemnity plans”) allow you to choose any dentist you desire. Other plans list specific dentists in your network. If your plan does not allow you to choose your own dentist , make sure the dentist is covered by your insurance policy. And remember that dental insurance doesn’t typically cover 100% of the cost associated with major dental services, so look for a dentist that offers no interest and extended payment plans. See what patients have to day about West County Dental in this 5- star Healthgrades review! Is Laser Dentistry Really Pain Free?